That crazy Mo…! He’s not a prophet for nothing, you know.. Remember, there’s no “I” in prophet. Unless of course you meant “profit”. But that wouldn’t be out of place either. While we’re on this subject, which exactly did come first; The Chicken or the Egg? Kudos to the Author. This one was a very good. The egg. Ancestors of chickens laid eggs. ummm… aren’t you risking the wrath of 2 billion muslims by drawing a comic of Mo’ ?? LIES! Chickens! They were born of their ancestors roe! There were certainly eggs before chickens. If you mean chicken eggs, modern science would still say the egg – being Darwinian and not Lamarckian. See the first episode. 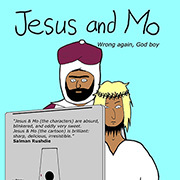 It is not an actual depiction of Mo, but a body double. The muslims should be satisfied with that. The genetic change would happen in the gamete or gamete forming cells. Therefore, the egg would be different before it could hatch into an organism. The egg came first. In fact, doing what is Ã¢â‚¬Å“rightÃ¢â‚¬Â has never been something stable and universal. This alone is enough to disprove the existence of godÃ¢â‚¬â„¢s commandments, thus god itself (himself in most cases). In every different society and time there are different Ã¢â‚¬Å“right doingsÃ¢â‚¬Â. It is quite simple: doing what is Ã¢â‚¬Å“rightÃ¢â‚¬Â is a SOCIAL CONVENTION, an HABITUS, a behaviour that is socialized (shared by means of teaching and comunicating) by most members of society. This is necessary for a society to function, and these Ã¢â‚¬Å“right doingsÃ¢â‚¬Â change as society changes. Of course many people arenÃ¢â‚¬â„¢t socialized correctly or suffer some sort of trauma so it is obvious that some may not do what is Ã¢â‚¬Å“rightÃ¢â‚¬Â. To talk about morality as something common to human kind is just as weak. Morality -if you can say such a thing exists- is socially constructed and is NOT universal. Of course many Ã¢â‚¬Å“right doingsÃ¢â‚¬Â (or moralities) are shared by most societies, simply for practical reasons, like: do not kill, do not sleep with your sister etc. by the way, AUTHOR: very good one! one of the best! therefore, paedophilia is ok, stoning to death is ok , that solves the problem, if god commands it or the prophet does it it (since we get our morals from scripture) it is good. No questions asked. Ti, I know what you’re talking about. I once wrote a letter to the editor in response to another person’s letter that suggested we “return to the laws of the Bible.” I pointed Deuteronomy 21:18-21 which states that if a mans son will not obey his parents, he must be taken before the village and stoned to death. Then I asked if that is what the person was suggesting, or shall we pick and choose what Bible laws we want to enforce? After the letter was published, I got a phone call from a reader. The man actually thought I was advocating for such punishments, and said that he agreed with me. He said that’s what God’s law says, so that’s what we must do. Needless to say I was astounded. I don’t have a habit of calling people idiots (other than Bush, of course), but this guy deserved everything in my formidable arsenal of expletives. It’s scary to know we have folks who can be every bit as dangerously fanatical as any fanatical Muslim, or one of any other religion, for that matter. pretty dang funny. i love it when each panel is funnier than the previous one! 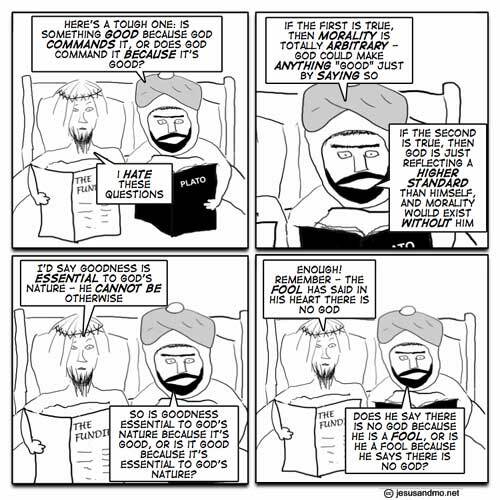 This is a very good illustration of the classic paradox of goodness and divinity. It’s blissfully powerful, in that it alone is sufficient to refute, irreversibly and forever, any notion that goodness derived from, or sanctioned by, God, is nonsensical. It shows that connecting goodnes with God in any way is at least nonsensical and at most impossible to maintain meaningfully. Any rational person who was also religious (no oxymoron or contradiction intended) should, on knowledge of this logical conundrum, give up religion for ever, or at least abandon all the moral dimensions of religion and just embrace some vague metaphysical mysticism. This was damn funny… and circle logic… or whatever they call it. I somehow got to remeber this one for the next familly dinner. Just the look on their faces, LOL! Somewhere in Proverbs (I think) it says the man who calls his brother a fool is in danger of hellfire. Does that mean Jesus is going to hell? Which comes first the egg or the chicken? Are abstract objects independent from space time continuum? I believe so, in this manner I believe that Universal ethics is an abstract object, such as numbers. The answer is that morality is an artifact of evolutionary psychology and social signaling and makes no logical sense. Maybe, but it makes biological sense as we do have mirror cells in our brains that are activated to reflect the emotions we see in an other person. So basic do unto other like you want to be done to yourself is based on your own emphaty which is just your brain reflecting other persons emotions.